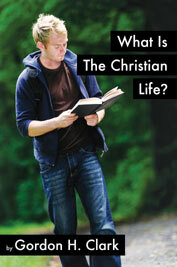 What Is the Christian Life? combines the second editions of Sanctification and Today's Evangelism: Counterfeit or Genuine? into one edition on the subject of the Christian Life. Also included are two essays by Dr. Clark - "Sanctification" and "the Christian and the Law." In the Evangelical world today, because of the rampant anti-intellectualism and relativism, the propositional truths of sanctification and the Gospel are under attack, even by many in "Reformed" churches. Although originally published in the late twentieth century, Clark's books on these doctrines and the many errors surrounding them are still apropos today. According to the Bible, all of salvation from election to glorification, is all of grace. In sanctification, we are neither to "Let go and let God," nor are we to be sanctified by our works. Rather, God sanctifies us through knowledge of his Word - of his truth, as Jesus prayed, "Sanctify them by your truth. Your Word is truth" (John 17:17). The difference between justification and sanctification is that our justification is wholly outside us - God declares us legally righteous by imputation of Christ's perfect righteousness to our account, while in sanctification God works in us through his Word and Spirit conforming us more and more to the image of his Son. What about the Gospel and evangelism? Much attention is paid to evangelism from "Revival" services to "Crusades" and "Festivals," but are the messages preached the Gospel - the Good News? Clark finds that much evangelism, in particular the more spectacular sort using mass media and big crowds, has garbled the message that Christ commanded the Church to teach. The result is church growth in numbers, while knowledge of Biblical Christianity among the "converted" is practically non-existent. The effect of today's evangelism seems to be more and more people learning less and less about Christianity, until everyone knows nothing of the truth that saves. The common thread running through both books is the Word of God and its systematic monopoly on Truth - the Truth that saves and the Truth that sanctifies. Let us return to what the Bible says about sanctification and evangelism as we seek to live the Christian life.. Contents: Foreword; Sanctification; Foreword to the First Edition; Introduction; Conversion or Repentance; Aberrant Theories; Bishop Ryle and Assurance; Perseverance; The Sacraments; The Christian Life; Conclusion; Appendix A: Sanctification; Appendix B: The Christian and the Law; Today's Evangelism: Counterfeit or Genuine? ; Foreword to the First Edition; Introduction; Emotions in the Bible; What Is Emotion? ; Emotion and Theology; What Is Evangelism? ; Faith; Assurance; Paradigms of Evangelism; Scripture Index; Index; The Crisis of Our Time; Intellectual Ammunition.